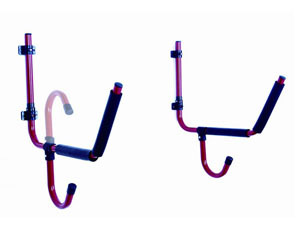 Product categories of Kayak Storage, we are specialized manufacturers from China, Kayak Rack Storage, Kayak Storage Hooks suppliers/factory, wholesale high-quality products of Kayak Storages R & D and manufacturing, we have the perfect after-sales service and technical support. Look forward to your cooperation! 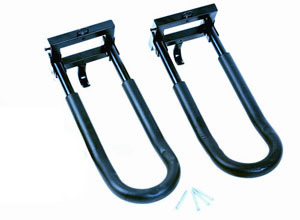 This heavy duty wall rack is an ideal wall to store your kayak or canoe and paddle when it is not in use. The upper cradle is padded so no to damage your kayak during storage and the lower arm is perfect for you paddle or Other accessories such as a dry bag or helmet. The top bracket that attaches to the wall has a clip in that once pushed back, allows the arms to swing back and lie flat against the wall therefore not taking up any space when it is not in use. Powder coated, with black foam pads. Complete with the fixtures to attach it to the wall.